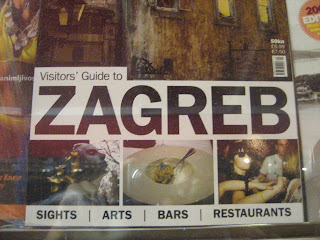 We arrived in Zagreb in the early evening. After finding a couple of hostels with no vacancies, we decided to check into a 3-star hotel for $110 a night - not usually our style, but it was getting late and we were tired of looking. After getting settled in, we walked along a beautiful series of parks and buildings about one kilometer long towards the main square in town (Trg Jelacica). Past that there are dozens of outside bars and restaurants. It seems that people here really enjoy sitting at an outside cafe/bar with a beer, a coffee or what ever - often it is a couple of young women. There seem to be many more women around than men. The following day we called a youth hostel run by an Austrian lady. It was a tram ride away from the central city, but was quiet and inexpensive. 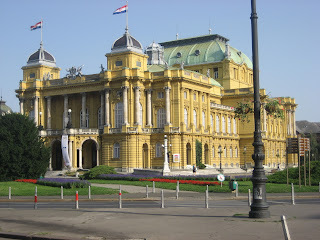 Zagreb is full of squares, parks, historic buildings, monuments, museums and churches. Architectually, it is a beautiful city that wreaks of history. The old part of the city has a cathedral with two tall splindly spires that looks very similar to St. Stephan's Cathedral in Vienna. One of the more interesting places we ran into on a covered street corner had a distinct religious feel to it, with candles burning and people praying at a small prayer area - it turned out that it was a site that the Virgin Mary had been spotted. We actually met an Israely couple who are touring the world with the primary goal of visiting and documenting the sites where the Virgin Mary has been seen. 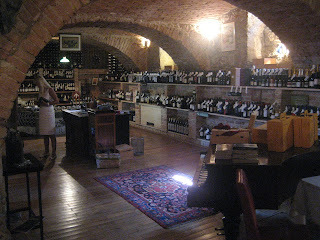 We found a wine shop that turned out to be the area's oldest wine cellar. The man running it was friendly and gave us a taste (more like two glasses) of some Malvacia produced on the Istra peninsula. Very nice, dry, good balance, with a hint of grapefruit. We ended up buying a bottle of it and a bottle of Palvec, a zinfandel clone, that we didn't get to taste. But he assured us that it was a good, full-bodied red. 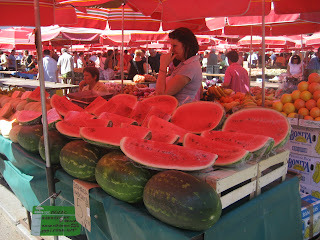 The Dolac market is right in the center of town and is very colorful, with a myriad of bright red umbrellas, many varieties of fruits and cheeses and souvenier shops. One floor beneath the market contains all the meats, more cheeses and fish. 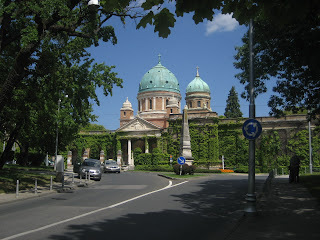 On of the more unusual places we visited was the Mirogoj Cemetary. It sort of reminded us of the Pere Lachaise Cemetary in Paris, where the likes of Chopin, Oscar Wilde, Edith Piaf, and Jim Morrison are burried. The entrance to the cemetary is quite grandeouse, looking more like a castle than anything else. The main mausoleum has some very ornate graves. Most of the headstones have the word Obitelj on it followed by the family name. It seemed that the word was related to "obituary". But we later found out that it is the word for "family". This is our second time in Croatia and we have yet to make it to Dubrovnik and to Plitvice Lakes National Park, a Unesco World Heritage site. From the photos I've seen, it is full of waterfalls and turquoise lakes, many that are interconnected. I suppose we'll be saving this for the next time. A couple of things we noticed in Zagreb is that graffiti artists have tagged every available wall in the city with the exception of some government buildings. It just seems to be an accepted form of expression. The other thing we've noticed (and not just in Croatia) is that half the people smoke. The evil tobacco companies have really done their marketing job extremely well here. In the morning we got a tram to the train station and found our way to the train to our next stop - Budapest.